The Puerto Rico Housing Finance Corporation and the Puerto Rico Housing Bank and Finance Agency merged under Act 103 of August 11, 2001, as amended. The name of the entity was changed to Puerto Rico Housing Finance Authority (PRHFA) and its corporate structure remained as that of a subsidiary of the Government Development Bank. Mortgage loans to developers for the construction, improvement, operation and maintenance of rental and for-sale housing for low to moderate income families. Mortgage loans to citizens of low and moderate income. Mortgage Loan Insurance Program (Act No. 87). Housing subsidy programs aimed at boosting home purchases. Section 8 program of the U.S. Housing Act (PHA). Performance Based Contract Administrator (PBCA) for HUD’s subsidy contracts for Section 8 projects in Puerto Rico. Administrator of the HOME Investment Partnerships Program since 2010. Puerto Rico's State Credit Agency for the Low-Income Housing Tax Credit program under Section 42 of the U.S. Internal Revenue Code, as amended. Responsible for the Puerto Rico Community Development Fund, a Community Development Entity participating in the New Markets Tax Credits Program of the U.S. Treasury Department. 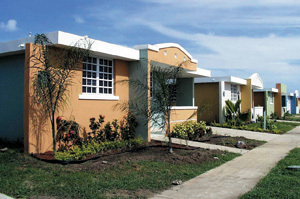 This tax credits program helps to provide funds for for-sale housing projects in the Commonwealth of Puerto Rico. PRHFA has streamlined and brought new efficiencies to the process of administering the development of housing at all levels. This GDB subsidiary's new organization and thrust has allowed it to effectively direct the housing programs championed by the government in recent years. For more information on PRHFA as a tax-exempt securities issuer, including its most recently released financial statements, click HERE.